How do you order Gravol Natural Source Ginger online? You can order Gravol Natural Source Ginger online from Canada. YouDrugstore is an online Canadian pharmacy, which means you pay the same price that Canadians pay. All you have to do is send YouDrugstore your order and our health care team will review it, process it, and ship your order directly to your mailbox at cheap shipping rates. Order Gravol Natural Source Ginger today and reduce your nausea, vomiting, or motion sickness as soon as possible. What are the side effects of taking Gravol Natural Source Ginger? Common side effects from taking Gravol Natural Source Ginger include diarrhea, heartburn, and general discomfort as a result of taking ginger. Because Gravol Natural Source Ginger does not contain dimenhydrinate like most other Gravol products it is non-drowsy. In rare cases, and in cases of an overdose, side effects can also include confusion, irregular heart palpitations, dizziness, and sleepiness. If you experience any of these symptoms or have any other unusual symptoms or side effects, please contact your health care professional immediately. Why is Gravol Natural Source Ginger used to treat nausea and vomiting? Gravol Natural Source Ginger is clinically proven to be effective in reducing nausea and vomiting. This Gravol product is also non-drowsy and taste free. Furthermore, Gravol Natural Source Ginger is made from certified organic ginger root. Ginger root has been found to be an effective means of treating nausea. Gravol Natural Source Ginger works by reducing the acids founds in the stomach. It is also safe for children six years old and older. 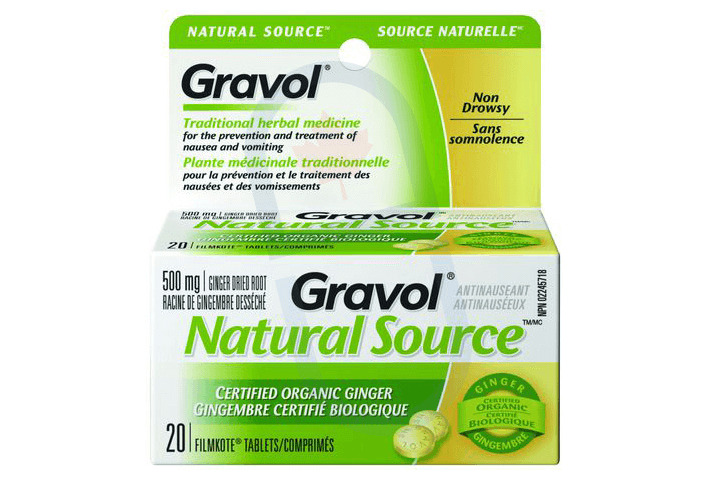 Order Gravol Natural Source Ginger online from YouDrugstore today and pay the same price that Canadians pay. Our online Canadian pharmacy will ship your order directly to your home. When should you take Gravol Natural Source Ginger? If you are suffering from nausea or vomiting Gravol Natural Source Ginger is a recommended option. You can easily order Gravol Natural Source Ginger online from YouDrugstore, an online Canadian Pharmacy. If you buy Gravol Natural Source Ginger from YouDrugstore you pay the same price that Canadians pay and we will ship it to your door at an affordable and convenient shipping rate. Gravol Natural Source Ginger is made with certified organic ginger root. Gravol is a leading Canadian brand name for nausea and motion sickness products. For nausea and vomiting take 2 tablets every four hours during the day as needed, but do not exceed 6 tablets a day. For motion sickness, two tablets should be taken about half an hour to an hour before any activity that may induce motion sickness symptoms, including traveling by car, air, sea, train, or bus, watching movies or videos, or playing video games. Please contact your health care provider if you have any questions or concerns about taking Gravol Natural Source Ginger. Who can use Gravol Natural Source Ginger to treat their nausea or vomiting? Gravol is widely considered one of the most recommended product brands by pharmacists in Canada and was also voted by consumers in 2012 to be one of the best product lines for those suffering from nausea or motion sickness. It is safe for children six years old and older. Pregnant women should consult their doctor first before using Gravol Natural Source Ginger. Nausea is commonly referred to as upset stomach. Motion sickness, also known as travel sickness or kinetosis, is when the body perceives movement differently from how the movement is perceived visually. It often creates nausea and fatigue as well, and usually culminates in an episode of vomiting. Motion sickness can also occur by watching movies, playing video games, and using virtual reality simulations. Those who find themselves suffering from nausea or vomiting, or the symptoms associated with motion sickness, should speak to their doctor about using Gravol Natural Source Ginger. Where can I learn more about Gravol Natural Source Ginger?